For the first time in Malaysia, Kuala Lumpur, Mapletree Investments (“Mapletree” or the “Group”) will distribute complimentary fleece jackets at Jaya Shopping Centre from 3 to 5 August 2018 (Friday to Sunday). Malaysian Citizens and Permanent Residents who are currently studying in, or proceeding to study at a university in the UK, US or Canada for tertiary education are eligible to collect their fleece jackets. This is one of Mapletree’s corporate social responsibility (CSR) efforts to support education, a key pillar of the Group’s CSR framework. The CSR initiative was first launched in at Singapore’s largest retail and destination mall, VivoCity which is owned by Mapletree on 28 July 2017.This year, the giveaway will be extended to Malaysia students studying in the UK, US or Canada. Students can register online at http://homeandaway-mapletree.com/my/ now, and collect their jacket from the booth on the Ground Floor (in front of the Oppo outlet), from 11.00am to 9.00pm during the three-day giveaway between 3 – 5 August 2018. Mapletree currently owns and manages a portfolio of 26 student accommodation assets with close to 7,000 beds located across 13 cities in the UK and 19 student accommodation assets in the US and Canada offering approximately 13,000 beds across 18 cities. Most of the properties are conveniently located near prominent universities, and boast modern amenities that cater to the lifestyle needs of college students. Studio, deluxe, shared rooms and en-suite options are available to meet every student’s budget. 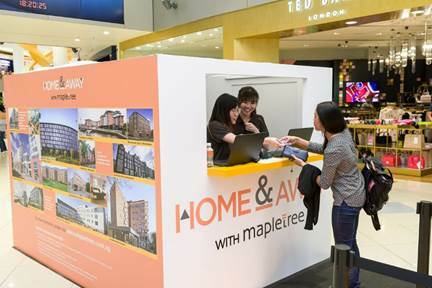 For more information, please visit Home & Away with Mapletree.Mapletree currently owns and manages a portfolio of 26 student accommodation assets with close to 7,000 beds located across 13 cities in the UK and 19 student accommodation assets in the US and Canada offering approximately 13,000 beds across 18 cities. Most of the properties are conveniently located near prominent universities, and boast modern amenities that cater to the lifestyle needs of college students. Studio, deluxe, shared rooms and en-suite options are available to meet every student’s budget. For more information, please visit Home & Away with Mapletree.